If you happen to be around Zagreb, Croatia, on April 8th you may want to meet us at “DataFocus 2014: international conference on digital evidence”, at the Hotel Sheraton. Amped Software will be holding a workshop entitled “Enhancing images and videos during investigations with Amped FIVE”. This entry was posted in Announcements, Events on March 31, 2014 by Martino Jerian. We are happy to announce our next training session, reserved for US law enforcement and government users, which will be held in Forth Worth, Texas, on May 5-9, 2014. This entry was posted in Announcements on March 20, 2014 by Martino Jerian. We just released an update to FIVE with a lot of improvements, bug corrections and customer requested features. Despite FIVE having very advanced and automated reporting capabilities, it’s undeniable that most of us use very often Word, PowerPoint and other programs to show our results to courts, customers and colleagues. They could be simple investigative reports or some tutorials for explaining how to work with images and video. 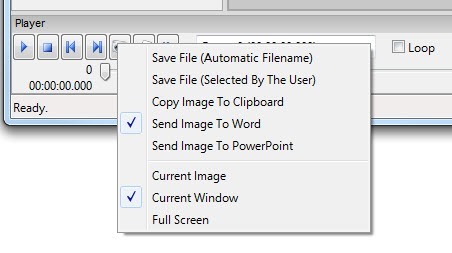 I do it daily and I was sick of saving pictures and importing them in other various applications, so we added a very convenient way to interact with third party programs. In the latest version of Amped FIVE (release 5989), if you right click on the Save Snapshot button in the Player Panel of FIVE you will have access to new settings for the Save Snapshot button. This entry was posted in Announcements, FIVE, New features on March 7, 2014 by Martino Jerian.